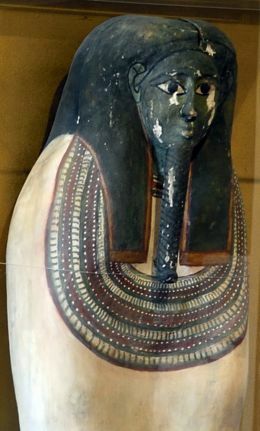 This Egyptian sarcophagus is one of several in The Museum of Man in San Diego, California. Early Egyptians preserved bodies in the sand, later they learned how to mummify bodies. Preserving bodies was important to ancient Egyptians because they believed in resurrection, that people would come to life after death and would need their bodies. Egyptologist Robert Brier, known as “Mr. Mummy,” is one of the world’s foremost experts on mummies.Visit his website to learn about Egyptian mummification process. Brier, Robert. “Egyptian Mummification” Discover Egypt.com Accessed 11/15/2015.